Wind shear continues to deteriorate the appearance of Bill. 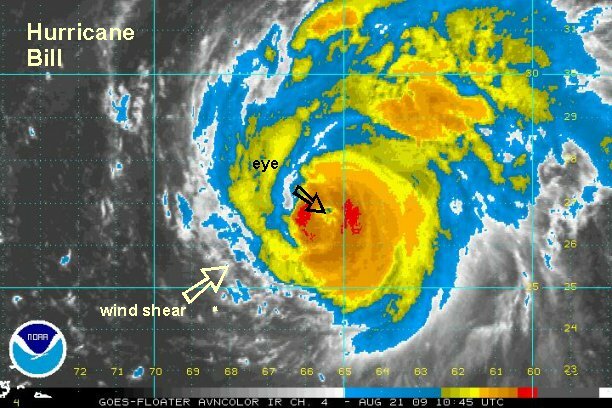 Although the eye is still intact, it is becoming more difficult to see on satellite imagery. The track has shifted a touch back to the east later in the period, putting the track close to the coast of Nova Scotia instead of inland. At 7:30 am edt / ast Bill was centered near 26.7° N / 65.5 W or about 395 miles south of Bermuda / 1060 miles southeast of Cape Cod, MA. Movement is northwest at about 17 mph. We estimate top sustained winds of 110 mph. The Hurricane Center is still at 120 mph on their last advisory. Lowest pressure reported from the recon: 951 mb. Effects:Rain squalls are approaching Bermuda now. Locally heavy rain of several inches is possible today through early Saturday. Even though the worst of the winds will pass to the west, tropical storms force winds (39-74 mph) are likely with gusts to hurricane force (75 mph) possible. Expect rough surf and strong rip currents on the eastern U.S. coast, Bermuda, and eastern Canadian coast from swell produced by Bill. Early Sunday: Passing 100-250 miles east of Cape Cod. Over the past few hours it appears that Bill is now moving north north west instead of northwest as it gets picked up by an upper level trough. Bill will start picking up speed over the next couple of days. The eye appearance is still ragged and cold tops continue to show no signs of strengthening. At 1:30 pm edt / ast Bill was centered near 28.3° N / 66.3° W or about 300 miles south southwest of Bermuda / 945 miles southeast of Cape Cod, MA. Movement is north northwest at about 18 mph. We estimate top sustained winds of 105 mph. The Hurricane Center is still at 115 mph on their last advisory. Lowest pressure reported from the recon: 951 mb. Effects:The first rain bands have moved through Bermuda. The next set is off to the south moving northward. Locally heavy rain of several inches is possible today through early Saturday. Even though the worst of the winds will pass to the west, tropical storms force winds (39-74 mph) are likely with gusts to hurricane force (75 mph) possible. Expect rough surf and strong rip currents on the eastern U.S. coast, Bermuda, and eastern Canadian coast from swell produced by Bill. Late Friday Night / Early Saturday Morning: moving west of Bermuda by about 150-200 miles. Early Sunday: Passing 140-225 miles east southeast of Cape Cod. Overnight Sunday / early Monday: near Newfoundland, Canada or just east. At 5:30 pm edt / ast Bill was centered near 29.9° N / 66.7° W or about 210 miles south southwest of Bermuda / 830 miles southeast of Cape Cod, MA. Movement is north northwest at about 18 mph. We estimate top sustained winds of 100 mph. The Hurricane Center is estimating 105 mph on their last advisory. Lowest pressure reported from the recon: 954 mb. Effects: The next is moving toward Bermuda. Locally heavy rain of is possible today through early Saturday. Even though the worst of the winds will pass to the west, tropical storms force winds (39-74 mph) are likely with gusts to hurricane force (75 mph) possible. Expect rough surf and strong rip currents on the eastern U.S. coast, Bermuda, and eastern Canadian coast from swell produced by Bill. 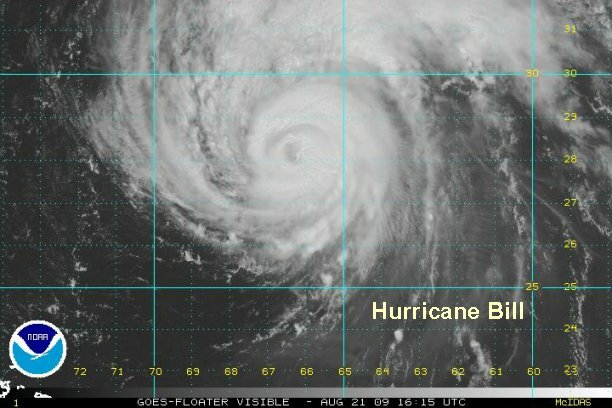 Hurricane Bill is now southwest of Bermuda in a much weakened state. It is still a hurricane, but not of the strength of a couple of days ago. At 10:30 pm edt / ast Bill was centered near 30.5° N / 67.2° W or about 195 miles southwest of Bermuda / 785 miles southeast of Cape Cod, MA. Movement is just west of north at about 18 mph. We estimate top sustained winds of 85 mph. Lowest pressure reported from the recon: 954 mb. Effects:A large area of rain is moving just west of Bermuda. Winds have not been stronger than minimal tropical storm force. With Bill weakening, we do not expect winds to reach hurricane force at Bermuda. 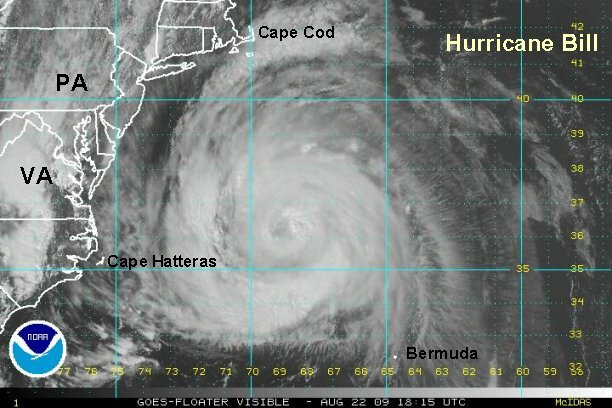 The closest pass to Bermuda will be later tonight. Rain may pick up and winds increase with gusts possibly to 50-60 mph. Expect rough surf and strong rip currents on the eastern U.S. coast, Bermuda, and eastern Canadian coast from swell produced by Bill. Some breezy winds of 25-35 mph and heavy showers may brush Cape Cod Saturday night and Sunday morning. These effects will move into down east Maine early Sunday and last into the early afternoon. Nova Scotia will get very windy weather, rough seas as well as heavy rain during the day Sunday. Newfoundland will see the worst weather Sunday night and into early Monday. 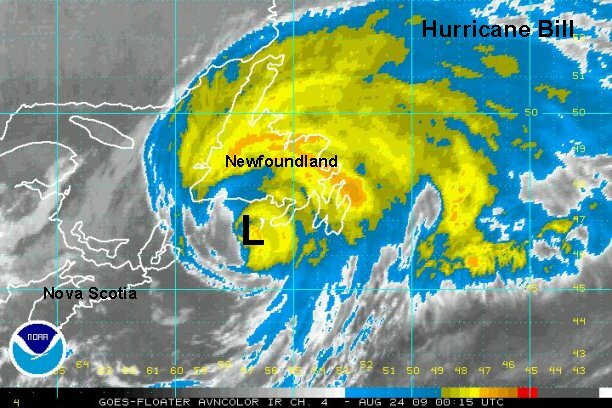 The worst of this hurricane appears to be headed to southern Nova Scotia and Newfoundland. This is the region of greatest concern. Bill will be heading north and gradually turning more north northeast soon. The closest pass to Cape cod will occur between Midnight and dawn Sunday morning. Some gusts to tropical storm strength are possible on the cape as Bill moves quickly past. 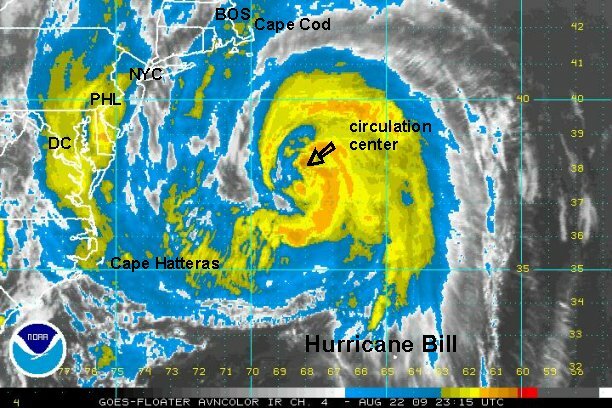 At 8:00 am edt / ast Bill was centered near 34.0° N / 68.4° W or about 235 miles west northwest of Bermuda / 410 miles east of Cape Hatteras, North Carolina / 510 miles south of Nantucket, Massachusetts. Movement is north at about 22 mph. We estimate top sustained winds of 95 mph. Our estimate is a little higher than the previous based on a recon from overnight. NHC estimates 105 mph. Lowest pressure reported from the recon: 960 mb. Bermuda had winds sustained from 35-40 mph overnight Friday into this morning. Some gusts my have been near 50 mph. The rain bands from yesterday and last night only produced a little under 1/2" or rain. The large area of very heavy rain associated with the core of the hurricane passed about 50 miles to the west. Bermuda made out very well from the effects of Bill. Effects: Expect rough surf and strong rip currents on the eastern U.S. coast, Bermuda, and eastern Canadian coast from swell produced by Bill. Cape Cod will see some breezy winds of 25-35 mph with gusts to about 45 mph possible. Heavy showers may brush Cape Cod Saturday night and Sunday morning The closest pass to the Cape will be around 4 am. These effects will move into Down east Maine early Sunday morning and last into the early afternoon. Nova Scotia will get very windy weather, rough seas as well as heavy rain during the day Sunday. Newfoundland will see the worst weather Sunday night and very early Monday. 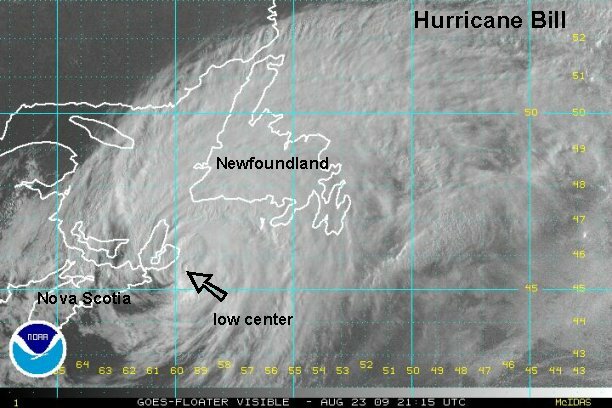 The worst of this hurricane appears to be headed to southern Nova Scotia and Newfoundland. This is the region of greatest concern. Early Sunday Morning: Passing 130-200 miles east southeast of Cape Cod. Sunday Midday: Over southern Nova Scotia or just offshore. Sunday late: near the east coast of Nova Scotia, west coast of Newfoundland, Canada. Bill's strength slowly decreases today as pressure inches upward. Forward speed will gradually increase over the next few days. The greatest impact from Bill will likely be tomorrow on the coast of Nova Scotia. At 3:30 pm edt / ast Bill was centered near 36.4° N / 68.0° W or about 425 miles east northeast of Cape Hatteras, North Carolina / 400 miles south southeast of Nantucket, Massachusetts. Movement is north northeast about 20 mph. We estimate top sustained winds of 90 mph. NHC estimates 100 mph. Lowest pressure reported from the recon: 964 mb. Cape Cod will see some breezy winds of 25-35 mph with gusts to about 45 mph possible. Heavy showers may brush Cape Cod Saturday night and Sunday morning The closest pass to the Cape will be around 4 am. These effects will move into Downeast Maine early Sunday morning and last into the early afternoon. Nova Scotia will get very windy weather, rough seas as well as heavy rain during the day Sunday. Newfoundland will see the worst weather Sunday night and very early Monday. The worst of this hurricane appears to be headed to southern Nova Scotia and Newfoundland. This is the region of greatest concern. 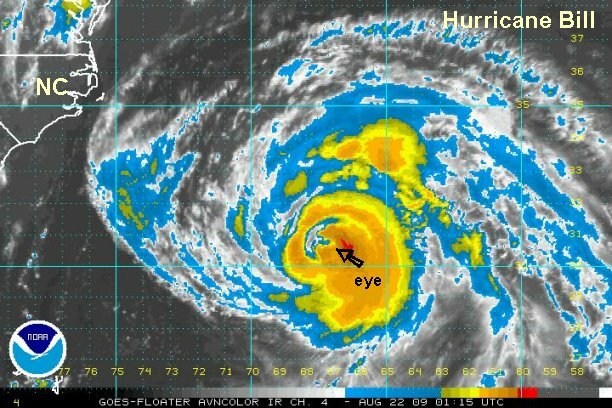 Bill's satellite imagery is indicating that the eye structure is deteriorating. This is one of the indicators telling of Bill's slow weakening. Bill will still most likely be a minimal hurricane as it nears the coast of Nova Scotia tomorrow by morning. Due to the colder water of the northern north Atlantic, Bill will lose tropical characteristics and transform into a north Atlantic gale over the next couple of days. 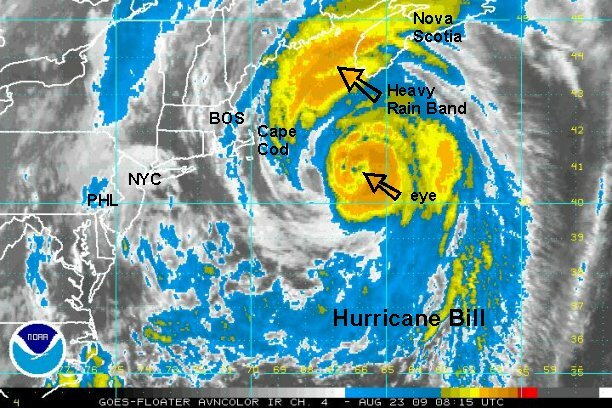 At 8:00 pm edt / ast Bill was centered near 37.8° N / 68.3° W or about 235 miles south southeast of Nantucket, Massachusetts / 550 miles south southwest of Halifax, Nova Scotia. Movement is north northeast about 24 mph. NHC is calling the motion north, although it definitely looks north northeast on the satellite imagery. We estimate top sustained winds of 80 mph. NHC estimates 85 mph. Lowest pressure reported from the recon: 961 mb. Cape Cod will see some breezy winds of 25-35 mph with gusts to about 45 mph possible. Heavy showers may brush Cape Cod Saturday night and Sunday morning The closest pass to the Cape will be around 4 am. Some effects will move into Downeast Maine early Sunday morning and last to about midday. Nova Scotia will get very windy weather, rough seas as well as heavy rain during the day Sunday. Newfoundland will see their worst weather overnight Sunday into early Monday. The worst of this hurricane appears to be headed to coastal Nova Scotia and Newfoundland. This is the region of greatest concern. 4 am Sunday Morning (closest to U.S.) : Passing 130-200 miles east southeast of Cape Cod. Sunday Morning: south of southern Nova Scotia. Sunday Midday: Over central Nova Scotia or just offshore of Halifax. Sunday Evening: near the east coast of Nova Scotia, Canada. A few small rain bands have formed over eastern Massachusetts and nearing eastern Long Island, NY. So far, winds have been rather minimal. Chatham has not gusted over 20 mph at this time. Offshore - a buoy 54 nm southeast of Nantucket has seas of 25' and a gust to 40 mph. Another buoy 30 nm east of Nantucket reported a wind gust near 30 mph and seas of 13'. Bill will still most likely be a minimal hurricane as it nears the coast of Nova Scotia tomorrow by morning. Due to the colder water of the northern north Atlantic, Bill will lose tropical characteristics and transform into a north Atlantic gale over the next couple of days. At 11:00 pm edt / ast Bill was centered near 39.1° N / 67.8° W or about 195 miles southeast of Nantucket, Massachusetts / 435 miles south southwest of Halifax, Nova Scotia. Movement is north northeast about 25 mph. NHC recently changed their direction of motion to agree with our assessment. We estimate top sustained winds of 80 mph. NHC estimates 85 mph. Lowest pressure reported from the recon: 961 mb. Cape Cod will see some breezy winds of 25-35 mph with gusts to about 45 mph possible. Heavy showers are brushing Cape Cod tonight and Sunday morning The closest pass to the Cape will be around 4 am. Some effects will move into Down east Maine early Sunday morning and last to about midday. Nova Scotia will get very windy weather, rough seas as well as heavy rain during the day Sunday. Newfoundland will see their worst weather overnight Sunday into early Monday. The worst of this hurricane appears to be headed to coastal Nova Scotia and Newfoundland. This is the region of greatest concern. 4 am Sunday Morning (closest to U.S.) : Passing 130-185 miles east southeast of Cape Cod. Hurricane Bill's strength changed little last night setting the stage for it to make landfall or staying just offshore near Halifax, Nova Scotia by midday. Bill is turning more northwest and will skim the coast of Nova Scotia before reaching the south coast of Newfoundland tonight. Currently from Bill: A rain band is over southeastern Massachusetts producing locally heavy rain. Doppler estimates that this band has produced 1-3" of rain so far. It is interesting to see that thunderstorms farther west not associated with the hurricane produced over 5" in isolated spots. 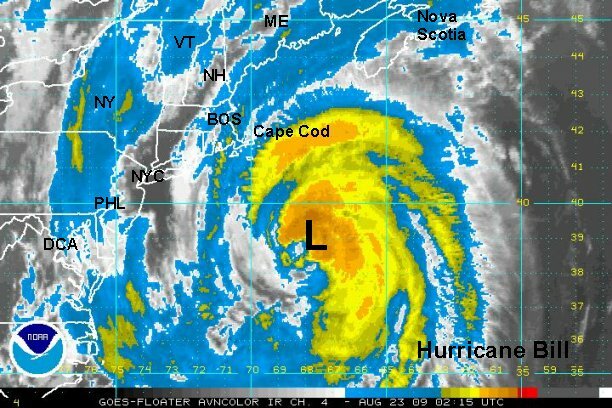 Winds have and will not gust to tropical storm force on Cape Cod, and tropical storm warning will be taken down soon. Generally winds did not exceed 25 mph. A few gusts may have been in the 30 mph range. Our early estimate of some gusts possibly to 45 mph was a little over. The closest pass to Cape Cod was near 4 am at about 150-160 miles. Seas from a buoy 170 nm east of Hyannis, MA reported a sea of 35' and a wind of 60 mph. That was very close to the center of Bill. We assume that was the weaker side and that the stronger winds are on the east side of the circulation. We believe that NHC's 85 mph sustained winds of 85 mph is a little generous...with that speed gusts of over 100 mph should be found. They are basing their wind closer to what the recon found in the lower level of the hurricane - a 98 knot wind in the lowest 150 meters. Due to the colder water of the northern north Atlantic, Bill will start losing tropical characteristics today and transform into a north Atlantic gale over the next 24-36 hours. 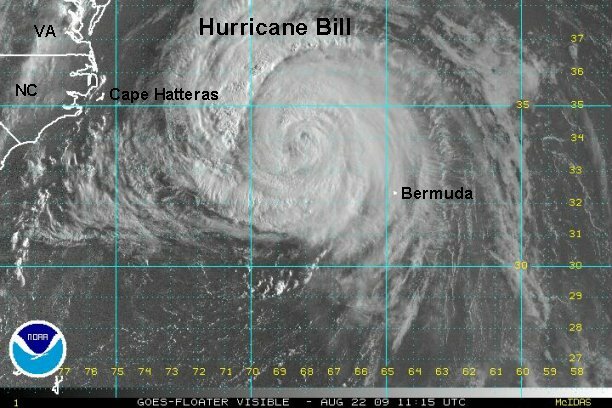 At 6:00 am edt / ast Bill was centered near 39.1° N / 67.8° W or about 225 miles southwest of Halifax, Nova Scotia. Movement is northeast about 25 mph. We estimate top sustained winds of 80 mph. NHC estimates 85 mph. Lowest pressure reported from the recon: 961 mb. Effects: Expect rough surf and strong rip currents on the eastern U.S. coast, and eastern Canadian coast from swell produced by Bill. Sunday Midday: Near central coast of Nova Scotia or just offshore of Halifax. Visible satellite show that wind shear has exposed the eye of hurricane Bill. This is also a sign of weakening and transformation into an extratropical system. Due to the colder water of the northern north Atlantic, Bill will continue to lose tropical characteristics today and transform into a north Atlantic gale over the next 24 hours. 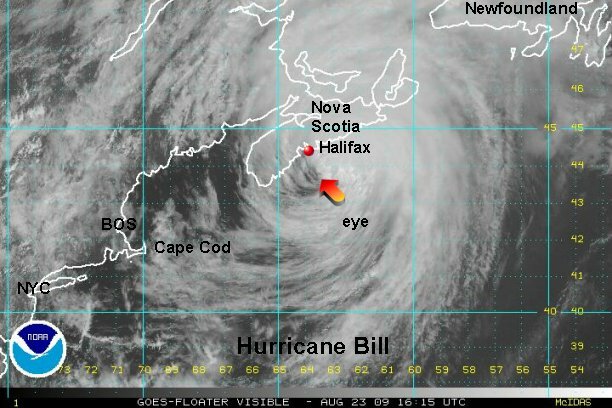 At 2:00 pm edt / ast Bill was centered near 44.4° N / 62.5° W or about 60 miles east southeast of Halifax, Nova Scotia. Movement is northeast about 35 mph. We estimate top sustained winds of 75 mph...on the east side of the circulation. NHC estimates 80 mph. Lowest pressure reported from the recon: 970 mb. Bill is rapidly moving across southern Newfoundland and will be east of the province by early morning Monday. Bill is transforming into an extratropical cyclone. The transformation should be complete by Monday. 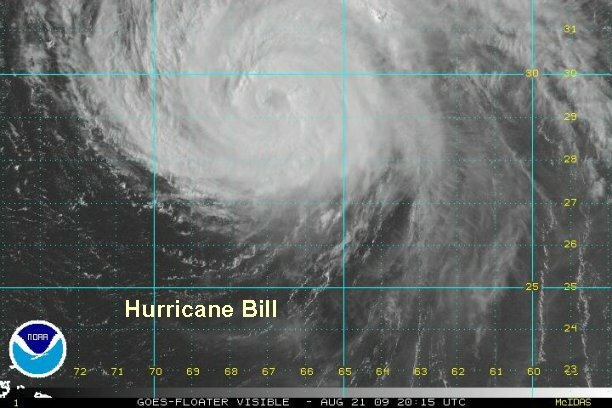 Bill is forecast to move across the north Atlantic toward the British Isles over the next few days. At 9:00 pm edt / ast Bill was centered near 46.8° N / 55.5° W or about 115 miles west of Cape Race Newfoundland. Movement is northeast about 35 mph. We estimate top sustained winds of 70 mph, now making Bill a tropical storm. NHC estimates 75 mph. Lowest pressure reported from the recon: 970 mb. This will be our last update on Bill.